Super lucky to be here in South Dakota Pheasant Capitol of the World. Lucky enough to have time and access to areas to train my 3 weims who just turned a year old. Able to hunt great land with freinds and family. Last 2 weeks I have probably seen more birds then most see in a whole season. Lots of points,honors, and retreives. Some great , some needing real improvement. So true, I had to use pigeons for my Setter. It got so she would point every one I put out , she would run over grouse ,woodcock and pheasants. Nascon, funny thing I had plenty of pigeons, pen raised quail&chuckar to train with. My female pup wouldnt point them. Didnt really care to "hunt" for them. Maybe too much pressure too early? Anyways first real contact with a wild pheasant while hunting and she was a grey statue. Have had no issues eversince. Hey weimdog, I live in Watertown. Would love to find someone with a place and birds for training within a reasonable distance. I have a 2 year old Brittany that needs more bird work. If you are interested I'd love to train with you a few times in the off season. In addition to bird hunting I run my dog in NSTRA field trials. Ever thought of trying your Weim's in NSTRA? I have trouble posting and now it acts like you dont exist to pm.? So you pm me a phone number and we can chat. Weird. When I click on Dakota Zeb's name, I get the PM option , no problem. Sorry I can't help you. PM sent with my contact information. Nascon, the transition from pigeons to wild birds can take a number of encounters depending on the dog's savvy. It is normal for a dog to struggle INITIALLY. Now, if you have done the proper early training with pigeons, your dog will put the pieces together. I strictly use pigeons on early development. My dogs are very respectable on a wide range of wild birds, including the King. Sadly, some dogs simply don't have the fabric/genetics to handle grouse efficiently and never will. I owned one that was an open FTCh. If they don't have the smarts, pace, coupled with the nose, you are in trouble hunting wild birds, especially grouse. Last edited by Featherfinder on Sun Jan 20, 2019 7:38 pm, edited 1 time in total. Sharon wrote: Weird. When I click on Dakota Zeb's name, I get the PM option , no problem. Sorry I can't help you. From my Samsung8+ I can pm option it just wont send! Also on most of my posts, I get a " string error" message? I can post a couple lines then come back with a edit to add to the original post. Never had a problem turning dog's on to wild birds from pigeons. Usually a couple birds and the wild one's are good to go. I don't check cord dog's into birds either, I let them go on pigeon's in remote traps and do my best to make them act like wild birds. You'll find when switching over if you check cord your dog that you'll have fairly poor luck getting into wild birds! You make a pigeon act wild and the dog learns to handle wild birds. Make a pigeon a training bird and the change over will be harder. You take your new pup into the field and it don't know wild from pen raised, you teach it that. It doesn't know a pheasant from a quail from a dicky bird! They learn from you. Number of people think the only way to train is on wild birds, don't agree but, if wild is all they know, at some point they will come around. If you make the pigeon act like a wild bird, all the pup then know's is wild birds. I've read a lot of time's about dog's that won't point pigeons. Not surprised, they were used as training birds. Idea is anything bad happens, it's a pigeon and you don't hunt them anyway! As a result the dog learns about training birds. 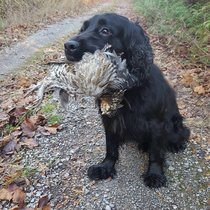 Lot of people use pen raised game birds but the problem with them is they don't act wild either and allow the dog liberty's that a wild bird won't allow! Had an old hunting friend come by with a setter that wasn't pointing a few weeks ago. Took 5 pigeon's and the dog was pointing. Hope he get's here some more. Keep it up and it will only take a couple wild birds and the dog will be good to go. You use a pigeon and teach the dog what a training bird not only act's like but also what it smell's like. Use the same pigeon like a wild bird and you teach the dog what a bird act's like! DonF wrote: Never had a problem turning dog's on to wild birds from pigeons. Usually a couple birds and the wild one's are good to go. I don't check cord dog's into birds either, I let them go on pigeon's in remote traps and do my best to make them act like wild birds. You'll find when switching over if you check cord your dog that you'll have fairly poor luck getting into wild birds! You make a pigeon act wild and the dog learns to handle wild birds. Make a pigeon a training bird and the change over will be harder. All my pups have pointed pigeons intensely at an early age because I present them as a wild bird. Me staying silent letting the pup have private interaction with the pigeon just as it would with a wild bird, no check cord, no whoa, no caught birds. My setups are in natural cover which I believe also plays a key role in my work. I also put my pups into wild birds along the way. Getting them pointing pigeons first, then shooting the pigeons has prepared them to do well early on in their encounters with wild bobwhites and pheasants. I have pigeons... not exclusively for dog training as I only use culls for that. My passion for racing pigeons is just as strong or stronger than my passion for dog training. Even though I have a ton of pigeons in the loft I rarely use them. I am fortunate though that I can walk out the back door and have the dog on wild birds within 10 minutes... although I cannot shoot those grouse and woodcock due to my close proximity to town. But contacts are contacts. I have never used pigeons to train my dogs. Been lucky I guess. Fortunately I can spend a lot of time with them in the field hunting every fall. We work the bugs out on the job. I'm fine with that. Never in a big rush to clean birds. Mostly my pups all had the right stuff given to them by God. And working with Labs can be pretty much a no brainer. They are so pliable ... usually. This latest one was the slowest starter of all but she finally developed into something special: a fantastic pointing dog. I hunted her behind my Fr Brittany for first two years so maybe that had something to do with it. Ellie now works birds like a pointer: careful approach, works around into the wind, points, holds till it moves, then back to the same stealth mode till she's got it nailed down again. VERY classy. Not what I'd expect from a flushing dog! But she's a total goofball when hunting with the other two dogs. 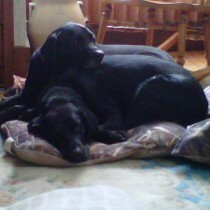 Busts my Britt's points and gets in the way when the old Lab is birdy. So she spent the first two years mostly by my side while the other two worked. Then the day came at the very end of 2017 season when the older dogs couldn't work. Old Lab was worn out and Britt was too small for the heavy cover where the only birds around were holed up. "It's up to you, youngster. Do or die time." Wow, what a surprise! She worked close, followed hand signals, great points, great retrieves, great nose. "Where the heck did this come from?!" This past season Ellie was so much fun I had to force myself to give the other two dogs a day in the field. I use only pigeons training anymore. Put them in a remote trap and you can make them act a lot more wild than any pen raised game bird. Turning over to game birds is no problem either unless you used the pigeon as a training bird without a remote. Pen raised birds you have no idea what they will do! Might flush or might run around on the ground. If they flush they might fly 20' and sit back down oh, and they generally let a dog right on top of them and just sit there. Pigeon in a remote never let's itself get caught on the ground and out and flying generally land in a tree, telephone wire's or goes home and lands on the loft roof. Lot of people won't use pigeon's saying they don't hunt pigeon's. Well that is a bad argument. Dog's that learn to point a bird on the ground, learn to point a bird on the ground! They haven't a clue in the early going what the bird is, just a bird that will fly away if it mess's up. The thing that really got me into pigeon's was cost. In those days I caught all my own pigeons, today I breed them! Quail were about $2 and chukar about $4 if I remember right. Today around here I have no clue what quail cost but chukar run about $9 each and generally good for a one time use! Yea,Super lucky to get the opportunity.